The title of this naval battle is Tribute to Nelson, by the British artist William E.D. Stuart. He flourished as a painter in the mid-19th century, but there is not much information available about this painter or his works. That is surprising, since he has left some exceptional paintings, like this one. We are assuming it refers to British Admiral Horatio Nelson, but there is no reference to any particular battle or war event. Based on the information on the box, the reproduction for the manufacturer F.X. Schmid was a courtesy of the Rehs Galleries Inc. in New York, USA. After having searched the inventory, I haven’t found this painting, and it is very likely that it went to some private collector. I completed the puzzle in the summer of 2014. These naval battle puzzles are challenging when they are larger, but in this case it was doable, because there are many different fields of color. It has a lot of detail and variation in shades. 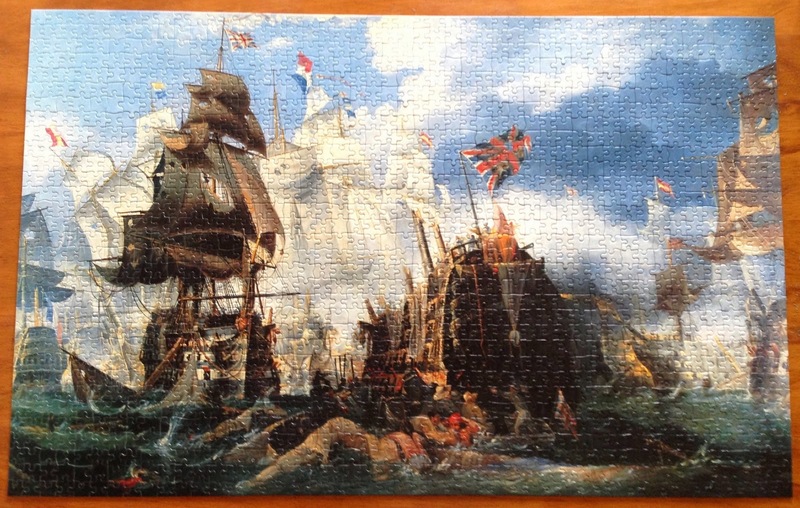 Most naval battles have a lot of sea and sky pieces, and they are difficult, but in this painting the scene is full and there are plenty of references, so the puzzle is easy. F.X. 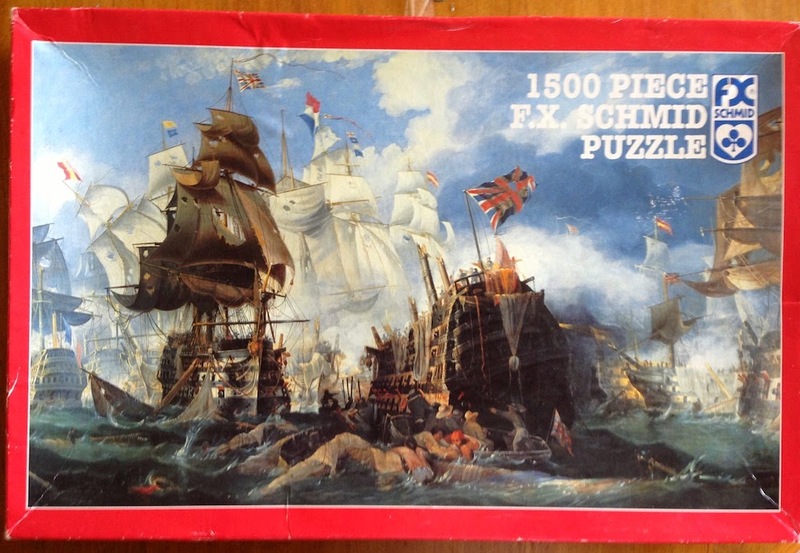 Schmid has manufactured very nice naval battle puzzles since the 80’s. Another great example is the Battle of Trafalgar, also painted by William E. D. Stuart. A picture of the assembled puzzle is available here. It is unfortunate that puzzle manufacturers don’t use these old paintings anymore. The exact number of pieces in this puzzle is 1504 (47 x 32). That is usually the number in most 1500 old puzzles by F.X. Schmid, although different brands have their own cut and the exact number varies. 1500, F. X. Schmid, Tribute to Nelson, William E. D. Stuart, 85 x 54 cm, Reference Number 98404. Previous Post	Puzzle Auctions. How much is a puzzle worth? Next Post	Should I Buy Insurance when Shipping my Puzzles?